Click here to learn more about Abzorb Vitamin & Nutrient Optimizer. "Expensive but worth it. Contains both serrapeptase and nattokinase, the two most fibrinolytic vegetarian enzymes out there. It can be taken in low doses as a daily cleanser, but it’s used by many as a therapeutic scar tissue destroyer in more moderate doses." Fibrin is a substance naturally formed in the human body that plays a significant role in our health and general well being. Fibrin is the main component responsible for normal scar tissue. Neprinol®-AFD by Arthur Andrew Medical contains a blend of systemic enzymes that specifically address fibrin levels in the body. Natural removal of fibrin by the body is accomplished by enzymes (principally plasmin) whose role is to support healthy fibrin levels. Neprinol-AFD provides superior fibrin-active enzymes in a combination designed to support healthy fibrin activity and much more. Neprinol is radically more advanced than today's leading systemic enzyme blends. Neprinol can supplement the enzymes that Mother Nature takes away from us as we age. Neprinol contains several sources of anti-oxidants, as well as a full spectrum of proteolytic (protein digesting) enzymes. Neprinol's exclusive formulation contains several highly concentrated digestive enzymes that assist the body in its ordinary digestion of fats, proteins, sugars, and carbohydrates. These digestive enzymes also work in the blood removing waste material and converting undigested food particles into energy. All of the enzymes contained in Neprinol come from microbial, fungal, or vegetable sources, and have a much wider pH tolerance than their animal-derived counterparts. Neprinol is vegan friendly. Our body produces certain chemicals in response to injury. Enzymes do not inhibit the production of these chemicals and thus reduce swelling and pain without interfering in the natural process of healing. Essentially, enzymes work synergistically with the natural repair mechanism of our body. Neprinol AFD is the most scientifically advanced broad spectrum enzyme blend available. Several years of scientific research and clinical studies have been conducted on each and every component that makes up Neprinol. Fibrinolytic enzymes such as Nattokinase and Serrapeptase can substantially lower C - reactive protein levels (CRP), an inflammation marker related to a healthy immune response. Neprinol does not generate gastrointestinal distress, and does not put stress on the liver. Not all enzyme blends are created equal. There are only a handful of enzyme formulations that actually work. The formulators of Neprinol have created some of the finest enzyme products available. You should know that enzyme potency is measured by activity levels. When enzymes are added to liquid they become active. Simply adding more mg of enzymes does not necessarily make the product stronger. Activity levels are measured by "FU's" or fibrinolytic units. 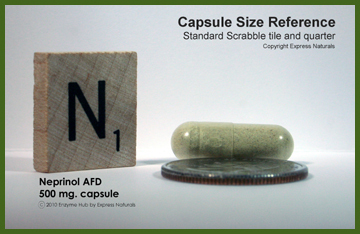 With most enzyme blends, typical serving size is 1-2 capsules, providing an average of 1,000 - 2,000 FU's. Neprinol provides 15,000 FU's per serving, yielding 133% higher activity levels. When choosing an enzyme look carefully for FU's rather than mg per serving. 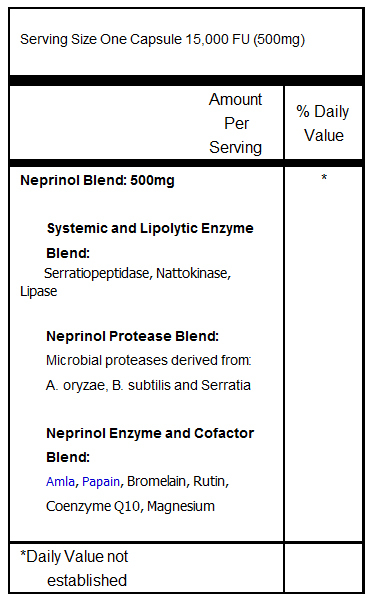 Neprinol contains the three main ingredients that you need to supplement your body's own systemic enzyme production. These enzymes are essential for a host of health support issues. Serrapeptase, a fibrinolytic (fibrin digesting) enzyme, breaks down fibrin within the body and helps promote a healthy immune system. Nattokinase, also classified as a fibrinolytic enzyme, may promote additional cardio-vascular health by releasing fibrin and digesting cellular debris. Finally Co-Q10, regarded as one of the most potent antioxidants available, is most commonly known for its superior ability to fight free radicals. Why do we need enzymes? As we age, enzyme production is radically diminished. These enzymes are needed to maintain a healthy immune system, healthy joints, good circulation and an overall balanced reaction to injury. The older we get our need for enzyme production increases while the amount of usable enzymes in our body is gradually depleted. Enzyme deficiency can lead to wide variety of health problems. These enzymes are biochemically more effective than our bodies own natural enzymes. Supplementation with Neprinol along with proper diet and exercise promotes your health and well being and may reduce your susceptibility to a wide range of health concerns that occur naturally with age. By supplementing and replenishing the body's enzymes Neprinol provides one of our most essential and basic biochemical needs. Neprinol has been used to strengthen immune systems, maintain proper circulation and to support the body's natural recovery mechanisms following physical stress occuring during sport and strenuous work activities. It supplements the body's natural fibrinolytic enzyme levels thereby helping to maintain a normal level of fibrin. No serious or adverse side effects have been reported from taking systemic enzymes such as Neprinol . Clinical studies have shown that even extremely large doses of these enzymes are not toxic. If you are taking blood-thinning medication, you should consult with your physician before taking Neprinol . Neprinol is a proprietary combination of Nattokinase, Serratiopeptidase, Rutin, Alma and other proteolytic enzymes that are specially formulated to promote a normal immune response. Neprinol can be used with other dietary supplements. Neprinol is completely safe to take with other nutritional supplements, i.e. vitamins, minerals, etc. Most pharmaceutical drugs will not cause contradictory issues except for anti-coagulant medications such as Warfarin or Coumadin, which should only be combined with Neprinol under the supervision of a doctor. · Activates naturally occurring plasmin, "the body's naturally released fibrinolytic enzyme"
· Decreases the proliferation of free radicals, supporting a healthy immune system. · Stimulates the metabolism to aid your body in the conversion of food to energy. · Essential to the production of ATP, cell respiration, electron transfer and the reduction of cellular oxidation. · Activates naturally occurring plasmin "the bodies naturally released fibrinolytic enzyme". *Free shipping on all orders via U.S. Priority Mail. Orders placed before 6:00pm EST are shipped the same day. Typical arrival time is 3-5 business days. No coupon code required.